Great short post by Frank Roche on why giving someone a job is such a big deal. Terrific advice from HR Examiner‘s Heather Bussing on what to do with your company’s social-media policy, especially in light of the NLRB’s continuing war on these policies. The best way to prevent employees from saying bad things about you is to hire the right people, give them the resources they need to do their work, and let them do it. When problems arise deal with it based on what happened. When you fire someone, it should be for their actions, not because they violated a policy. If employees are constantly violating policies, you have a serious management problem. And more policies won’t fix it. I agree wholeheartedly with Heather’s advice, and not just because she cited my two-word blogging policy. Along the same lines, here’s an approach for how companies should handle having a Facebook policy. Hire for passion and commitment first, experience second, and credentials third. There is no shortage of impressive CVs out there, but you should try to find people who are interested in the same things you are. You don’t want to be simply a stepping stone on an employee’s journey toward his or her own (very different) passion. Asking the right questions is key: What do you love about your chosen career? What inspires you? What courses in school did you dread? You want to get a sense of what the potential employee believes. Read the other seven here. They’re from his new book, Passion Capital (affiliate link). I believe that even if customers fully understand its pricing strategy, J.C. Penney is not going to get the revenue/loyalty windfall that it is hoping for. It’s time to put pride aside and revert back to a discounting strategy. Mohammed is a very smart guy and he’s written a couple of good pricing books: The 1% Windfall and The Art of Pricing (both affiliate links). But I don’t care for his advice that JCPenney should surrender and return to the brainless approach of discounting. When you rely on discounts, you send a message to customers that your stuff isn’t worth as much as you originally said it was. This is true whether you’re a midmarket retailer, a car company, or a law firm. Discounting belies a lack of creativity. No one is going to ever say, “Hey, let’s go to JCPenney because they have a new pricing strategy.” Ever. Firing people is the hardest thing a manager or employer can do. Here’s a checklist to help you make it just a little bit easier. Don’t fire when angry. Take enough time to make sure that you’re not making the decision for emotional reasons. Choose the appropriate day and time to minimize additional pain. For example, don’t do it right before Christmas, or on the employee’s birthday, or when everyone else is going to be milling around. Choose a location in the workplace that offers privacy, with the door closed. If you’re concerned about an angry or violent reaction, have security or another coworker nearby and ready. Have the employee’s final paycheck ready for the meeting. Include pay for the entire day of the termination, as well as any other money owed. Make sure your payroll people keep the termination secret. Make sure you include pay to cover any accrued but unused vacation. Gather up any material that your state requires you to give to terminated employees. Often, this includes information on unemployment benefits and health-insurance continuation (COBRA). In a front-page story with a bizarre exclamation mark in the title, the Sunday New York Times explains that the growth of the e-book market is forcing writers to churn out more books and stories faster. This of course makes me wish I’d learned how to type properly. But some authors said that even though they are beginning to accept them as one of the necessary requirements of book marketing, they still find them taxing to produce. Two very different stories have dominated Red Sox Nation this week, and both contain lessons for employers everywhere. The second story is a sports tragedy, in that it’s not a real tragedy but sports fans see it as one. It involves Josh Beckett, an arrogant, petulant starting pitcher who used to be the Red Sox ace. Beckett helped lead the Florida Marlins to a World Series championship in 2003, and then did the same for the Red Sox in 2007. But since then, he has lost his elite status and begun pitching like he doesn’t really care. So far this season, Beckett has pitched poorly, owning the second-worst ERA in the American League. On Wednesday last week, new manager Bobby Valentine announced that Beckett had an issue with his lat muscle and would be skipping his Saturday start against the Orioles. That weekend, because of poor starts and two extra-inning games, the Sox bullpen was called upon to pitch 27 innings. Even an outfielder had to pitch two innings. But Beckett was unavailable to pitch, presumably because of his lat. A few days later, it was revealed that Beckett had played golf on the Thursday before the Orioles series — the day after Valentine announced that Beckett would skip his Saturday start. The Boston sports media had a field day, and Red Sox fans were livid. Beckett finally returned to the mound this Thursday and got only seven outs while giving up seven runs on seven hits. When Valentine pulled him in the third inning, the Fenway faithful booed heartily, and one fan behind the dugout was caught on camera mimicking a golf swing. Then in his postgame press conference, Beckett poured gasoline all over the place and lit it on fire. Metaphorically speaking, of course. Showing incredible tone-deafness, the pitcher defended his golf outing despite his inability to pitch that weekend. Here’s a guy making nearly $500,000 a start who apparently doesn’t care enough about his job (which is secure through 2014), his employer (both the team and the fans who pay the bills), or his teammates. Contrast that with Carl Beane, a man who adored his job, even when he was making one ten-thousandth as much per start as Beckett. When people work for money — even a lot of money — they’ll usually (but not always) show up when they have to and do just enough to keep that job. But they won’t show you the passion that excellence requires. Beckett used to have it back when he was an ace pitcher. Five years, 30 pounds, and 80 strokes per round later, that passion appears to be gone, and with it, any hint of excellence. On the other hand, Carl Beane left us and the job he loved too early, and he left at the top of his game. Employers: hire passion first and talent second. Passion can turn talent into outstandingess (which may not be a word, but whatever), but talent without passion will eventually land you in the bunker. This is very simplistic, but you only get paid for things you actually bill to the client. If it doesn’t make it onto the bill, you won’t get paid for it. Remember that quick email you sent from your blackberry? Bill it. Remember that “two-second” question that turned into a ten minute diatribe? Bill it. Remember when your partner walked through your open office door and you had a twenty minute brainstorming session on litigation tactics? Bill it. Unless you express your time, you can’t get paid for it. Further, unless you describe all of your work, your client doesn’t understand all the value you are providing for the fee that you charge. No wonder people hate lawyers. It’s not that the “client doesn’t understand all the value you are providing.” If the lawyer thinks that the value comes from the time spent sending a quick Blackberry email, then the lawyer doesn’t understand the value. A lawyer (or any other professional) who understands value prices it. Everyone else just measures time and bills it. And annoys the hell out of their clients. Here is the six-minute “LexThink .1” speech I gave in Chicago in March at the ABA TechShow. In it, I explain the three simple steps you need to take to get someone to do what you want. LexThink follows the “Ignite” speech format: six minutes, 20 slides, 18 seconds per slide, advancing automatically with no control by the speaker. Enjoy. And if you want the free Result Triangle worksheet, it’s right here. You can print it out and use it right now to help solve whatever problem you’re facing. The other nine are just as good. Click the title above and read them. By the way, this post’s title refers to the story Leo McGarry tells Josh Lyman. Great TED talk (actually, a TED-Ed talk) by “MythBusters” host Adam Savage on “How simple ideas lead to scientific discoveries.” A ton of great information in just seven and a half minutes. Word is a horrible example of bloatware at its worst. I now do all of my writing using iA Writer or Pages. I wrote Firing at Will: A Manager’s Guide in Writer. Then I had to import the files into my publisher’s template. In Microsoft Word. Which made me die a little bit, a chapter at a time. Victorio Milian on the significance of billion-dollar Instagram’s having no HR department. The Red Sox have nine players on the disabled list to start the season (Andrew Bailey, Chris Carpenter, Carl Crawford, Rich Hill, Bobby Jenks, Ryan Kalish, John Lackey, Daisuke Matsuzaka and Andrew Miller) who are making a combined $57,246,000. That’s more than the entire payroll of the Athletics ($55,372,500) and Padres ($55,244,700). You know how hard it is to get someone to do what you want them to do? It’s pretty hard. And you know what? We make it harder. We get lost in the details. We fuss about incentives and penalties and policies. We overcomplicate problems. So if complexity is our problem, then it stands to reason that simplicity is the solution. We need to figure out exactly what we’re trying to do and how best to do it. Well, that sounds fine. But how do we actually make simplicity solve our problems? To find out, I went through nearly two decades of case files, looked at thousands of business interactions. Where had I messed up? Where had things gone smoothly? And a pattern emerged, where complexity caused problems and simplicity led to success. The Result Triangle works in every business context: negotiations, sales, customer service, management, litigation, pricing. Whatever field you’re in, you can use the Result Triangle to simplify your problem and get someone to do what you want them to do. These three points help you figure out what you want … and how to get it. Let me give you 3 quick examples to show how they work in real life. I usually fly Southwest Airlines. And many of you know that on Southwest, you have to check in early so that you don’t get stuck with a middle seat. Southwest doesn’t do seat assignments. Instead, you check in and get assigned a number. Get a lower number, get a better seat. Why does Southwest do this? Because their goal is to keep their planes in the air as much as possible. Open seating, flying only one type of jet, and even “bags fly free” all lead to more time in the air. And more airtime means more profit. Planes make money in the air, not on the ground. Their planes spend 30 percent more time in the air than their competitors’, and they’re the only airline making a profit. By clarifying their goal — “planes in the air” — Southwest gets their people to focus on doing what’s most important. We tend to take our goals for granted without giving them a lot of thought: To close the deal. To win the case. To make the sale. But a goal needs to be more precise. Clarifying your goal — boiling it down to its essence — is the first step to achieving it. My dad had this winter coat that he loved and he wore it until it finally fell apart. Turns out my brother was planning a trip up to L.L. Bean in Maine, so my dad asked him if he could pick him up a new coat while he was there. So my brother brings the coat to try to exchange it and of course he has no receipt because my dad bought it so many years ago. And the folks at L.L. Bean can’t find the same coat. So instead of sending him away, they give him a different one, brand new, without any hassle. Because L.L. Bean cares so much about customer satisfaction. And you know what? L.L. Bean must have known that, but they gave him a new coat anyway. Because they were focused on showing how much they care. Showing that you care makes people want to do what you want them to do. Because of the coat, my family keeps coming back, and we’ve told this story to hundreds of people. By showing they care, L.L. Bean gets people to keep shopping there and tell others how great they are. The third point is “address the fear.” I was at a Denver steakhouse recently. Great food, fantastic service. This place focuses on a great experience. When it came time to order, we picked out our steaks and we were trying to settle on a side dish to go with the steaks. The waiter recommended this fancy Brussels sprouts dish. Now, I like Brussels sprouts as much as the next guy, I really do. But this dish sounded a little too daring for me. The waiter said, “Why don’t you just give them a try? If you don’t like them, I’ll whisk them away and replace them with anything you want, no questions asked.” So we tried them, and you know what? But even so, we didn’t ask him to replace them. We just moved them around on our plates. Because we didn’t want to ruin the experience. The waiter had addressed our fears about not liking the Brussels sprouts, and that made us happy, even though our fears actually came true. People’s fears are what keeps them from doing what you want. By addressing those fears, you help people get past them. Even if you can’t prevent those fears from coming true. Simply addressing the fear helps make them want to do what you want them to do. You can start using it today. 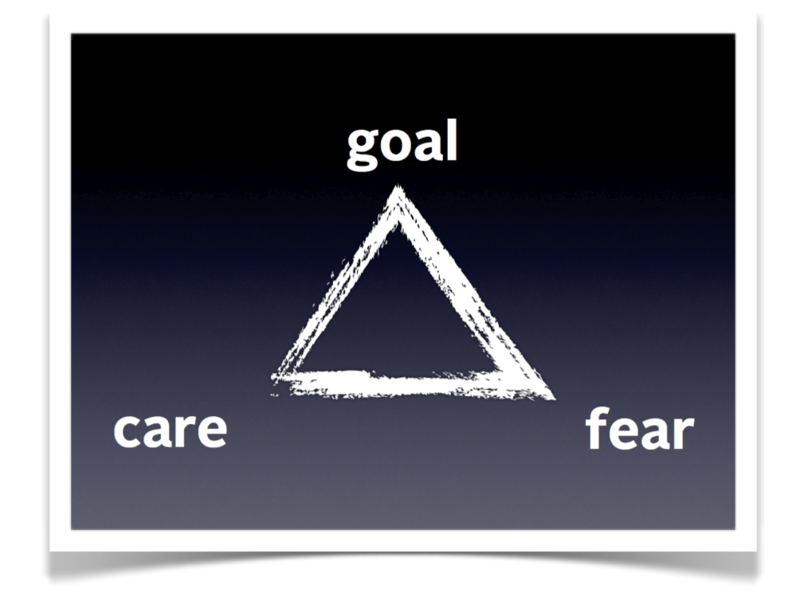 Anytime you need to get someone to agree to do something, whip out your trusty Result Triangle. You’ll be amazed at how this focuses your efforts. When you do these three things, you simplify the problem you need to solve and you improve your chances of success. People will want to do what you want them to do. Download a handy PDF of the Result Triangle Worksheet that you can use right now to help solve whatever problem you’re facing.